Prime Minister Viktor Orbán’s proposal to modify Hungary’s constitution to keep refugees out has failed. Out of 199 members of parliament, 131 voted in favor of modifying the Fundamental Law for the seventh time in five years and 3 were opposed. There were no abstentions. Neither Jobbik, the Socialists nor LMP participated in the vote, while Democratic Coalition’s (DK) four independent MPs absented themselves from parliament. Hungary’s new constitution, the Fundamental Law, was unilaterally adopted by the Fidesz-KDNP political alliance in 2011. Orbán personally proposed it be amended for the seventh time in five years in response to the October 2nd referendum. Although the referendum was technically invalid, an overwhelming majority of those who bothered to participate voted “no” to the question of whether Brussels should be allowed to mandate the settlement of migrants in Hungary without the consent of parliament, something Orbán considered a mandate for constitutional amendment. To make the amendment, Orbán needed to secure the support of a two-thirds supermajority in parliament. Fidesz is currently two seats shy of the supermajority, having lost these seats in by-elections to Zoltán Kész (independent) and Lajos Rig (Jobbik). In the run-up to today’s vote, far-right Jobbik signaled that it would support Orbán’s constitutional modification if the government would end its controversial residency bond program, declaring it is not enough to prevent refugees from coming to the country, but that the government must stop wealthy foreigners as well. Although there has been much talk in Fidesz circles over the past month or two about ending the settlement bond program at the end of 2016, the government has yet to announce a formal decision. 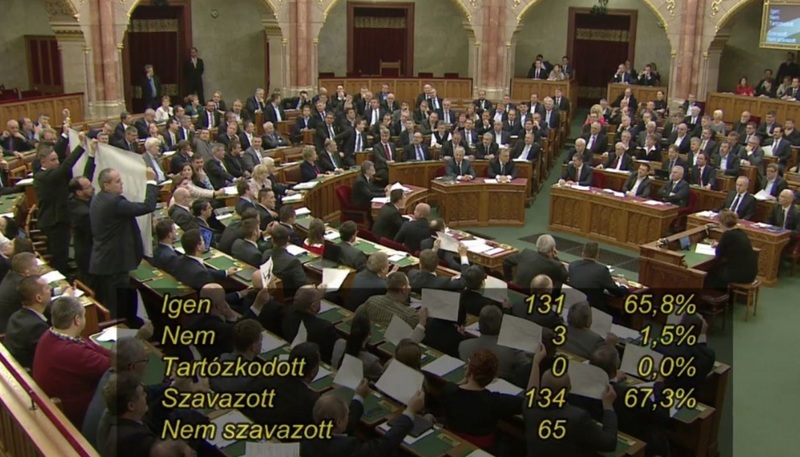 As a result, Orbán lacked the votes he needed to push through his constitutional modification. Hvg.hu reports that right after the failed vote, Orbán and propaganda minister Antal Rogán appeared quite happy. Orbán later told members of the press that Fidesz would decide at its next meeting whether it would attempt to modify the constitution again.